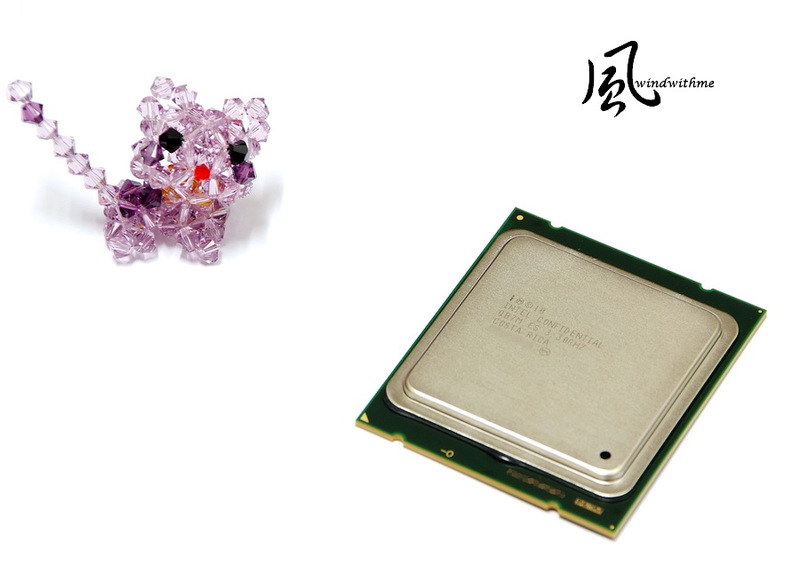 Nov 2008, Intel launched first Core i7 in LGA 1366 platform to redefine the enthusiast position. 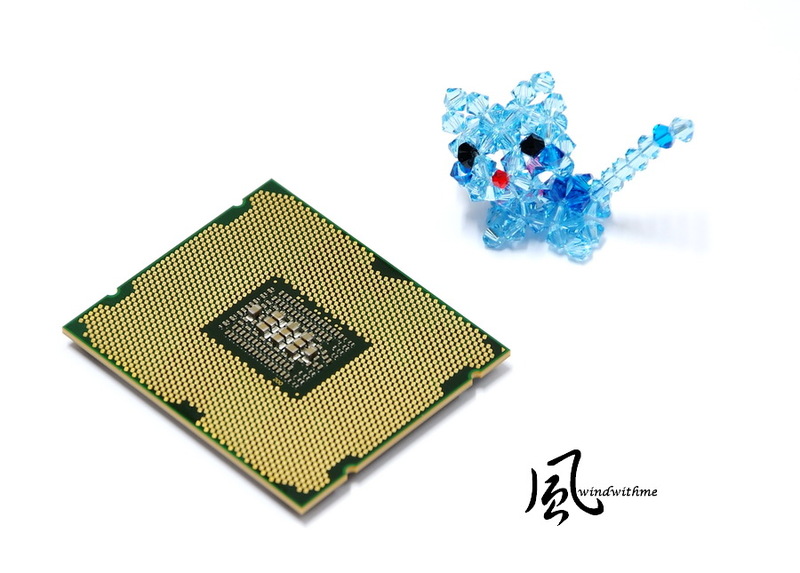 2009, Intel launched LGA1156 for mainstream to mid-high range, called first generation Core i structure. Jan 2011, Intel launched 2nd Generation Core i, LGA 1155 platform, to replace LGA 1156 product line. 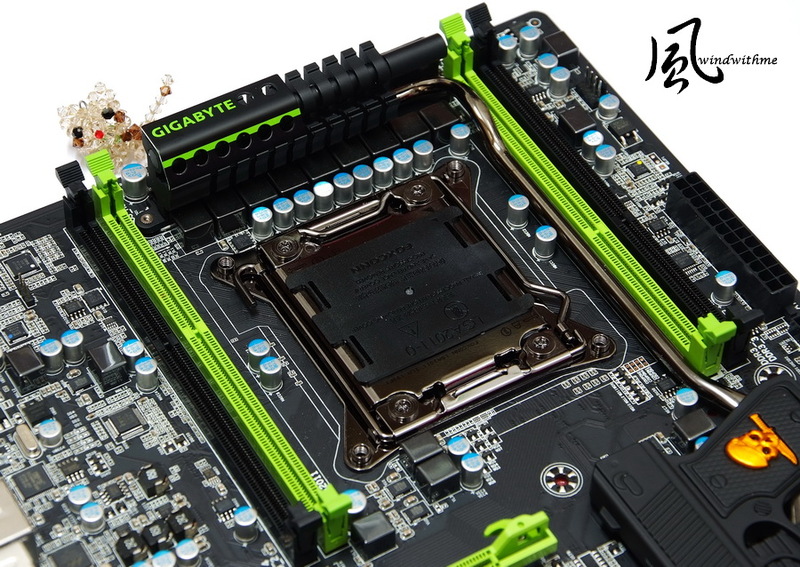 However, Sandy Bridge structure didn?t phase into high end market immediately. That?s why LGA 1366 X58 platform stays for 3 years. 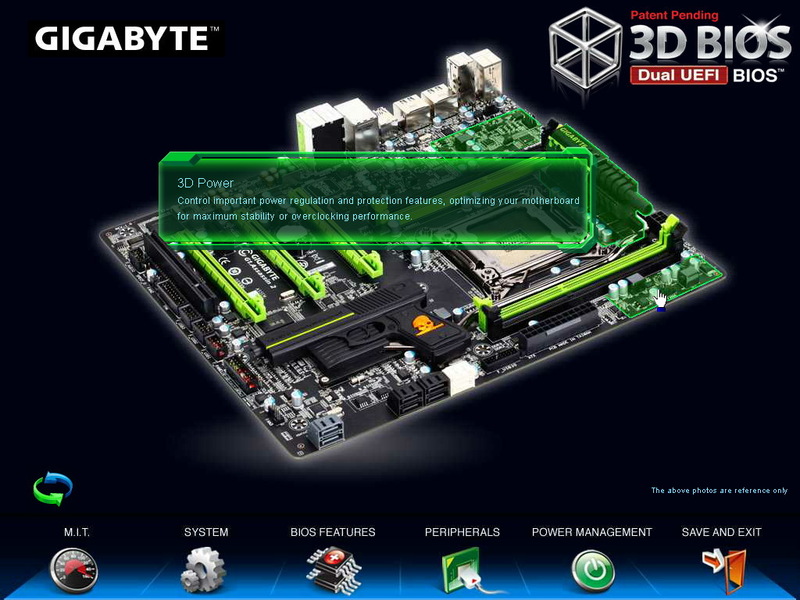 Finally, 14 Nov, Intel announced latest LGA 2011 platform with X79 chipset, called Sandy Bridge-E. 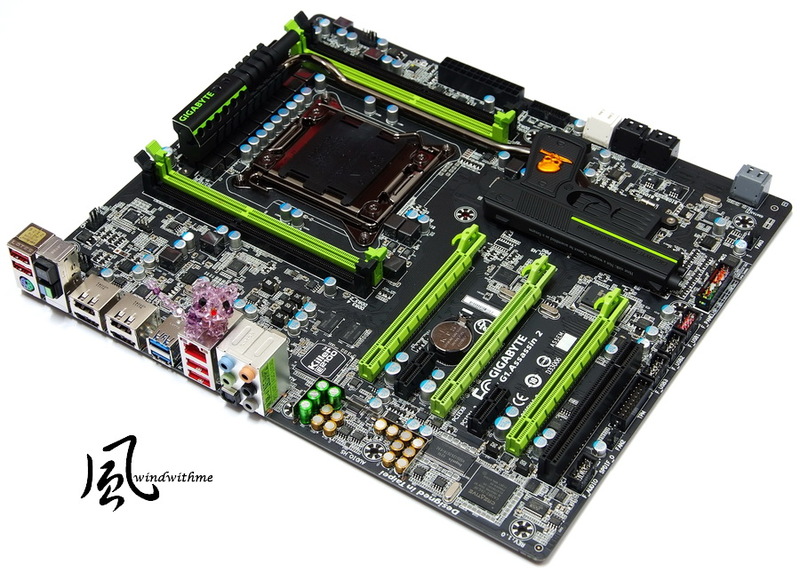 The main product change in 2011 is LGA 1155 replaces LGA 1156 and LGA 2011 replaces LGA 1366 product line. 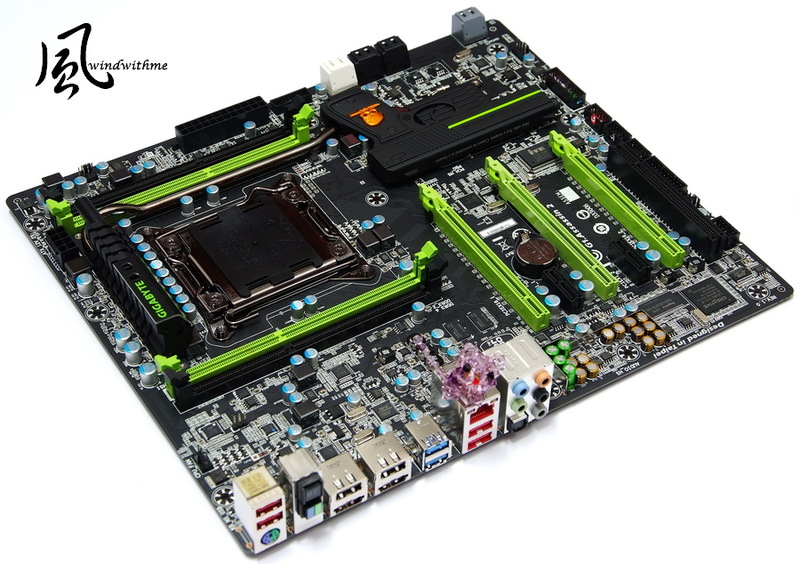 As latest Intel Enthusiast product, LGA 2011, the market position is same as LGA 1366. CPU is 6C12T mainly. i7-3820 is 4C8T, similar to i7-920. 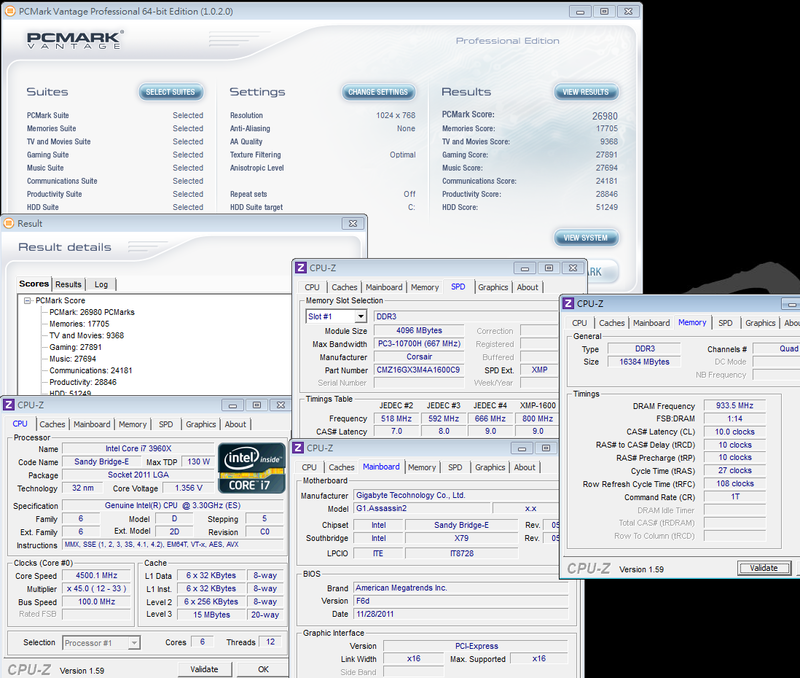 LGA 2011 first launch 2 CPUs, i7-3930K and i7-3960X, are both 6C12T. i7-3820 4C8T will be launched in Jan 2012. The price should be similar to i7-960 or i7-2600K. I am using Intel Core i7-3960X, same price as 990X, is 999USD by K SKUs based. The clock is 3.3GHz. It supports Turbo Boost 2.0 auto OC technology. 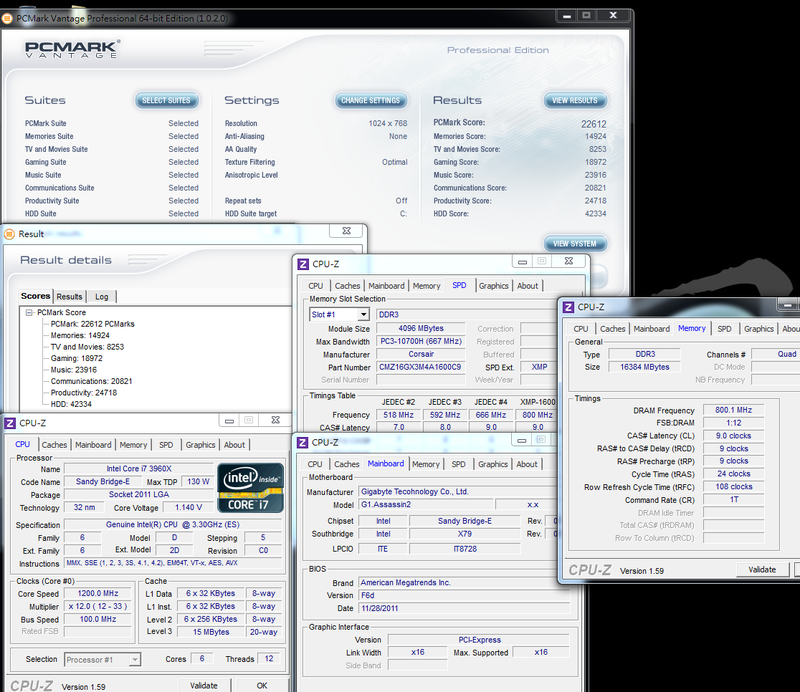 The max clock is 3.90GHz. It?s physical 6 Cores and Hyper-Threading technology supporting 12 threads, called 6C12T. 32nm manufacturing, TDP 130W, 15MB L3 Cache, the most high-end CPU in LGA 2011. 3960X backside should be 2011 dots in theory. CPU dimension is much bigger than LGA 1366. 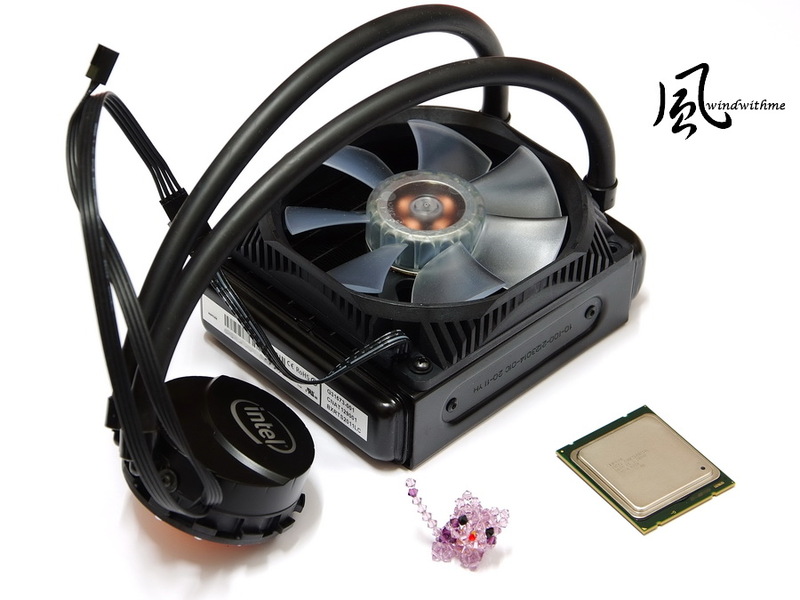 The main difference of LGA 2011 is optional cooler. Intel provides 2 kinds of cooler for users. 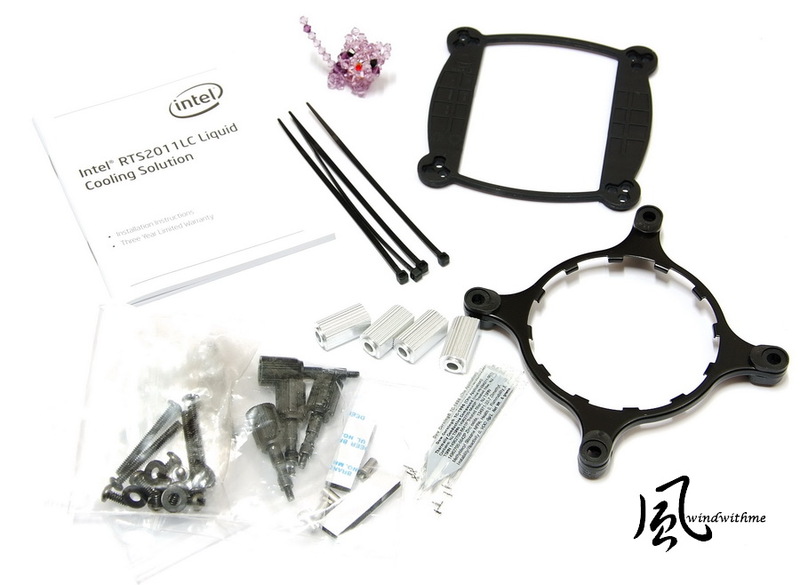 Intel BXRTS 2011AC cooler and Intel RTS 2011LC water cooling kit. 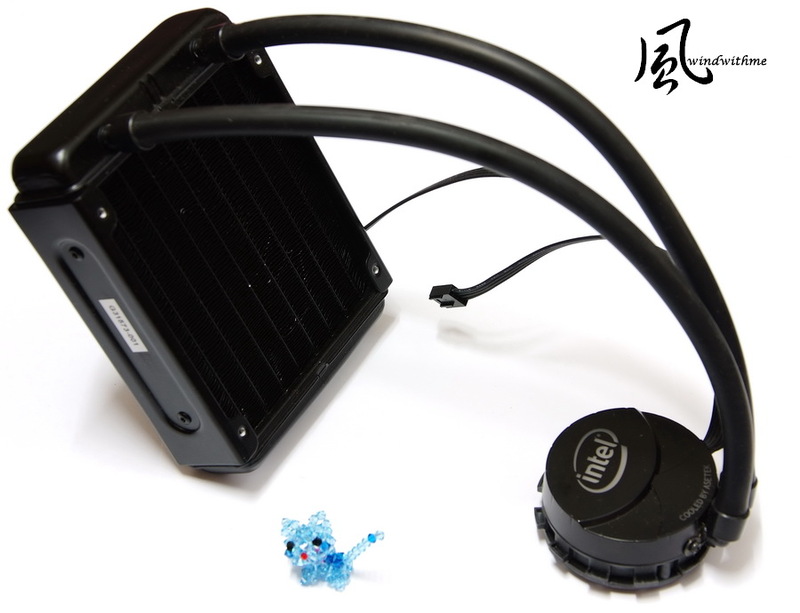 Intel original water cooling kit is similar to others closed pattern kit. CPU contact surface is copper. If they can polish, it will be even better. Installation guide, accessories and kits. It supports Intel LGA 1155/11156/1366/2011. Whole kit is 3 years warranty. I think water cooler should provide better service to encourage more users to use it. 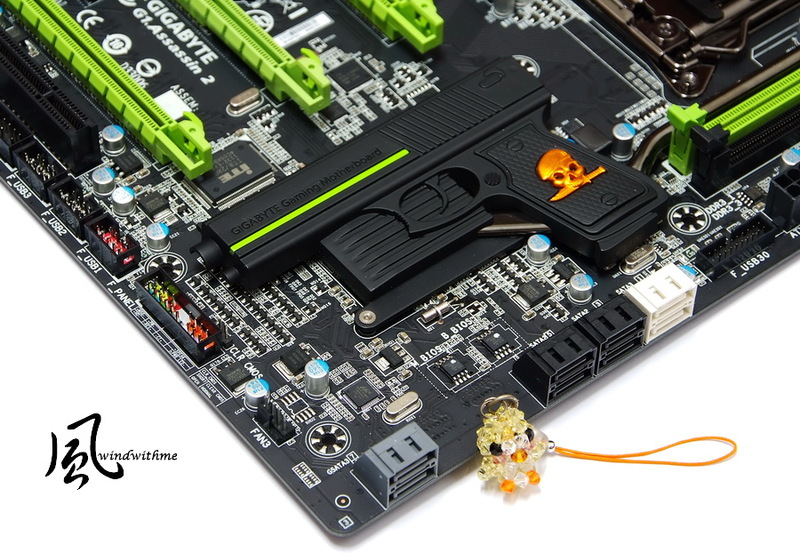 MB is GIGABYTE G1.Assassin2, X79 Chipset, for Gaming design. It?s same as X58 G1.Assassin color tone, black and green. The appearance is rare to see. It?s E-ATX and size is 30.5cm x 26.4cm. G1 is for Gaming market. 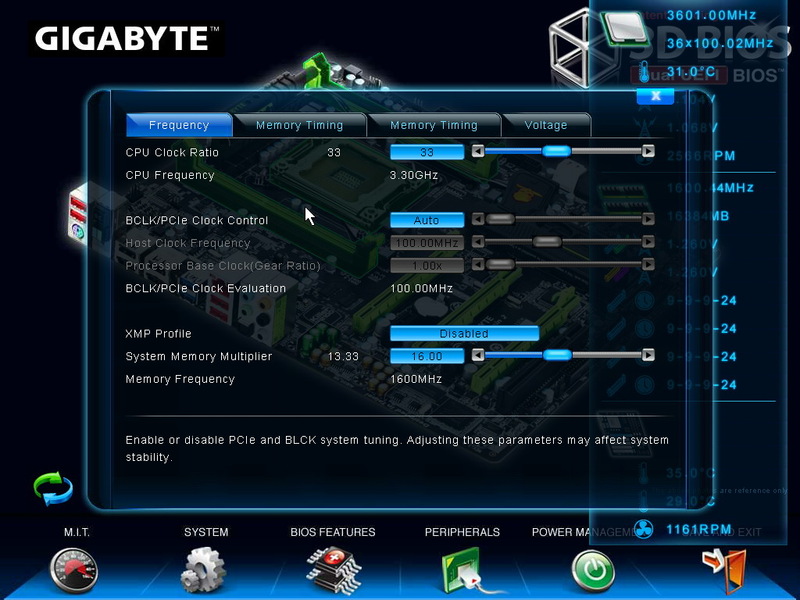 GIGABYTE uses better audio and LAN components. 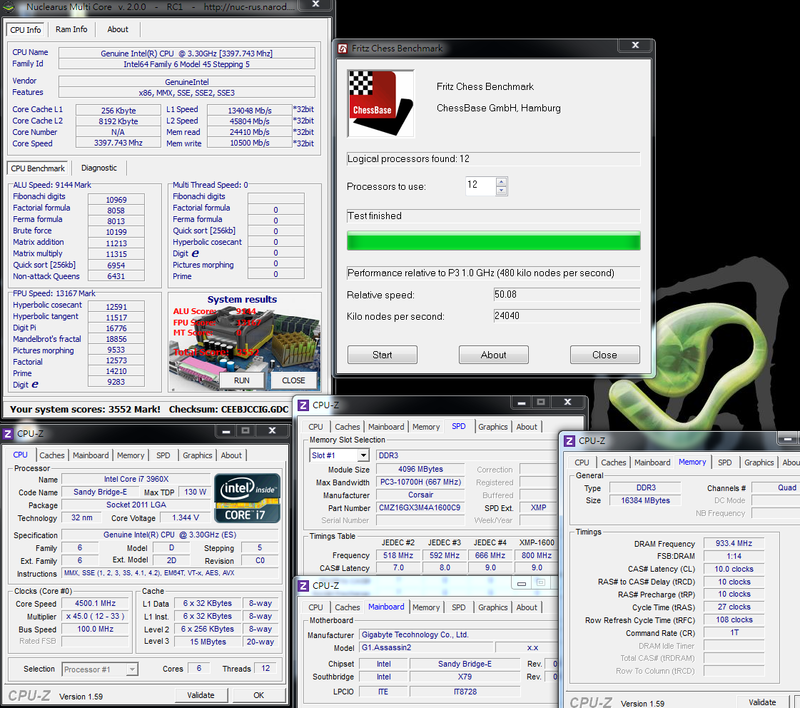 4 X Black SATA, provided by X79 and support SATA2. It can mix up to support RAID 0, RAID 1, RAID 5 and RAID 10. 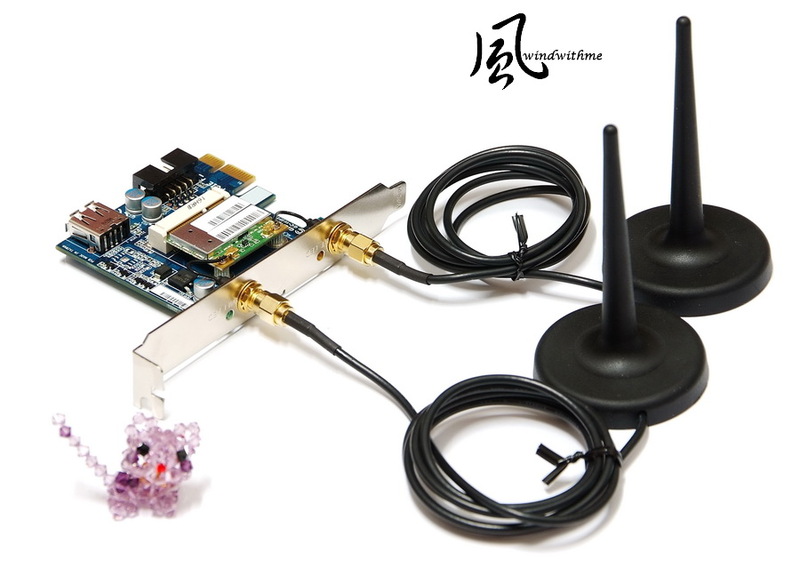 The performance is based on installed SATA devices. 2 X Gray SATA, provided by Marvell 88SE9172 and support SATA3. It supports RAID 0, RAID 1. 2 X 64 Mbit flash, Dual BIOS, 1 X front USB 3.0 and 3 X USB 2.0 devices. LGA 2011 CPU uses 16 phases digital PWM. CPU cover is plating processed which is better texture. There are pull rods in both sides. You must be more careful when install CPU. 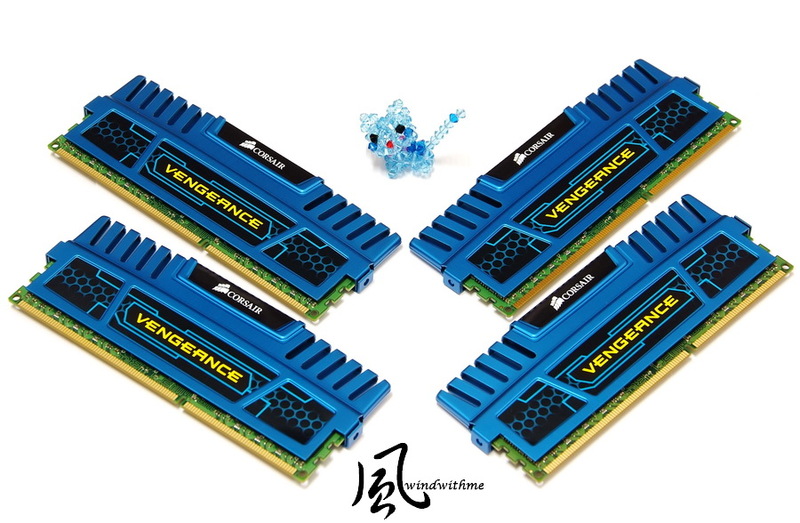 4 X DIMM DDR3 support 1066/1333/1600/1866/2133. DDR3 max capacity is 32GB. It supports quad channels and Extreme Memory Profile. DDR3 has 2-phase PWM. Right side is 24-PIN power connector. Creative Sound Blaster X-Fi Audio Processor, CA20K2. It built-in 128MB Memory for CA2020K2. This design is for Creative high end audio card only. Nichicon MUSE ES(Green) and MW(Yellow) Japanese audio caps. 100% copper shielding provides the highest quality sound resolution. 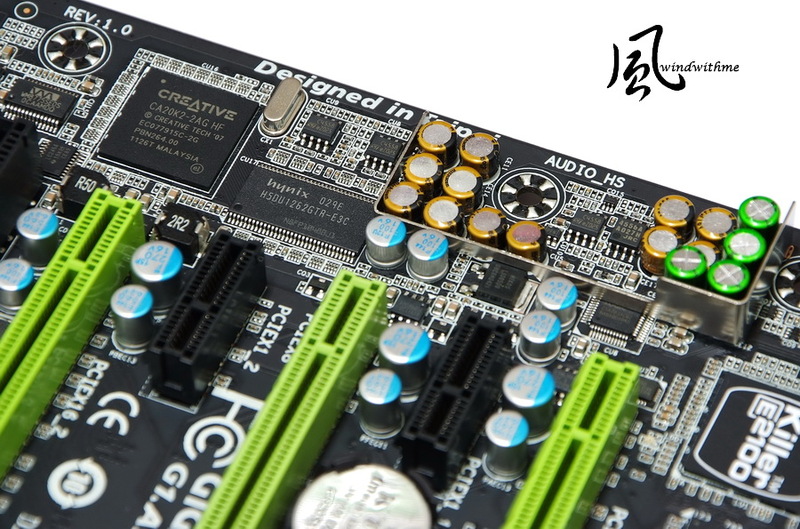 The design and components are high end audio card level. 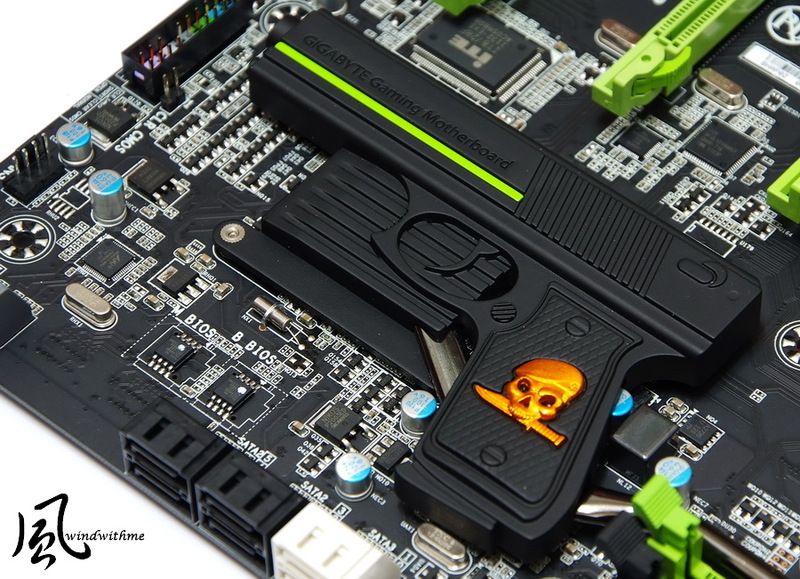 X79 chipset heatsink is hand gun this time. The design is exquisite. 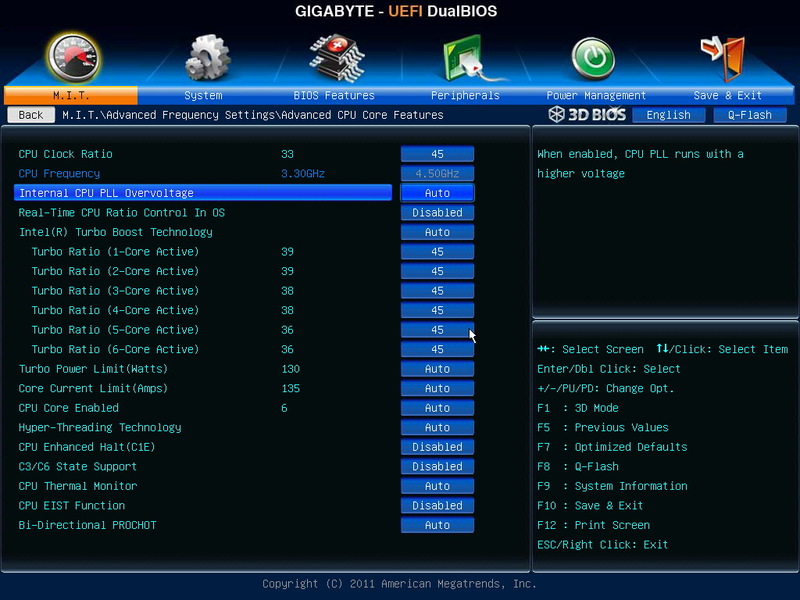 This time, GIGABYTE adds BT4.0 and Wi-Fi PCI-E card. Lower-right are 2 different USB ports. It supports Apple latest iPhone4S or any other smart phones or tablets which support BT and Wi-Fi. This pic is installing 2 antennas. Left green LED is WIFI and right orange is BT. X58 is the first triple channel platform. X79 enhances to quad channel DDR3. 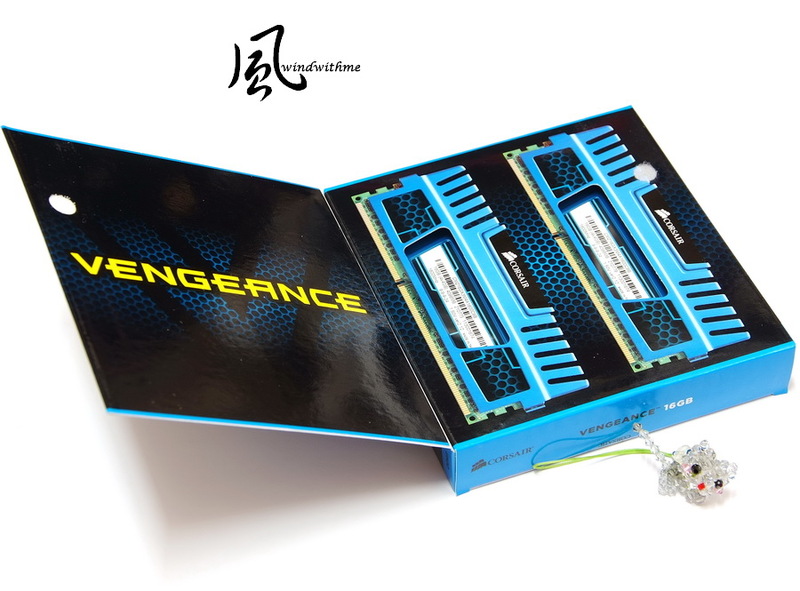 DDR3 is using CORSAIR VENGEANCE, CMZ16GX3M4A1600C9. The packing shows supporting Intel/AMD platforms. DDR3 capacity is 4 X 4GB. Blue color is main tone for this series. The packing is elegant. 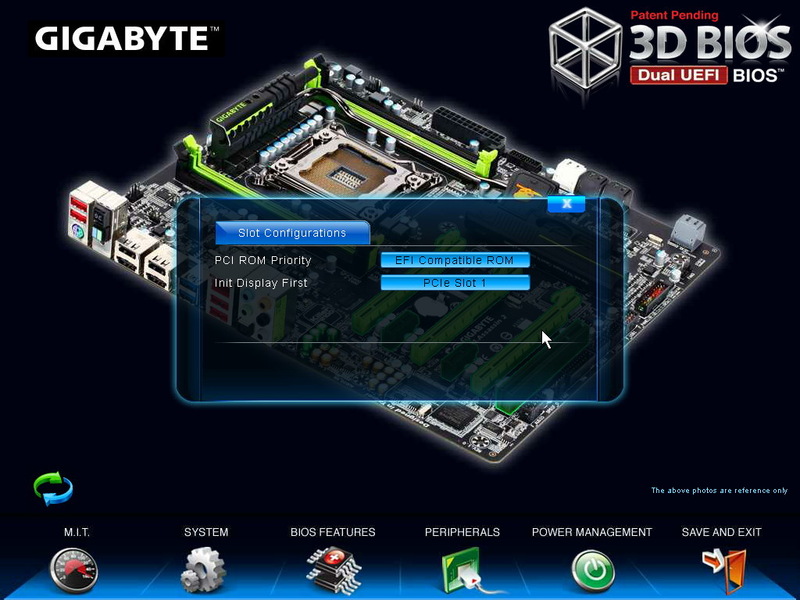 Users can open cover to check the DDR3 detail spec. 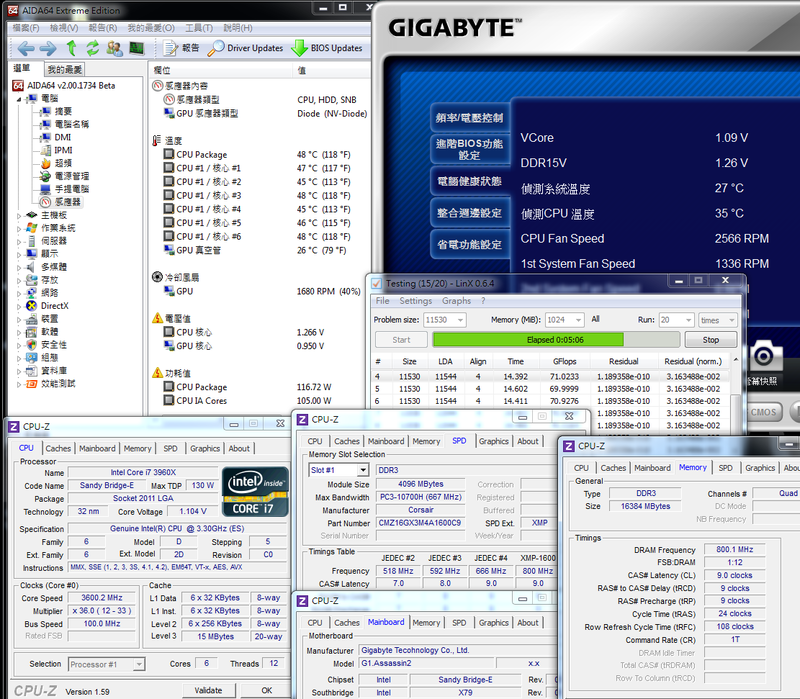 DDR3 clock is 1600, CL is 9 9-9-24 and voltage is 1.50V. LGA 2011 DDR3 default voltage is 1.50V. 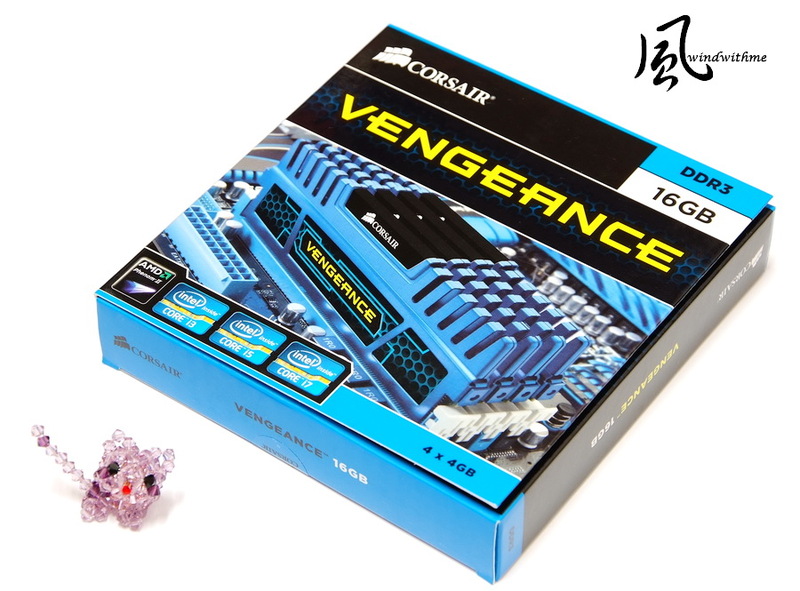 VENGEANCE series has bigger heatsink. In internet, you can see gold, green, red, black and blue colors for different spec. Enable C1E and Turbo Boost. 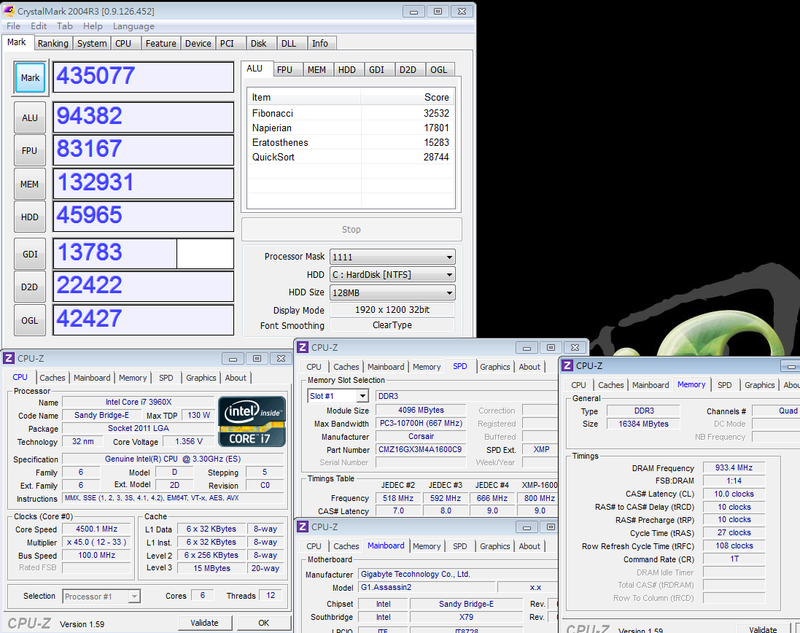 Clock is floating between from 1200~3900MHz by CPU utilization ratio. Nuclearus Multi Core cannot run Multi Thread Speed item. 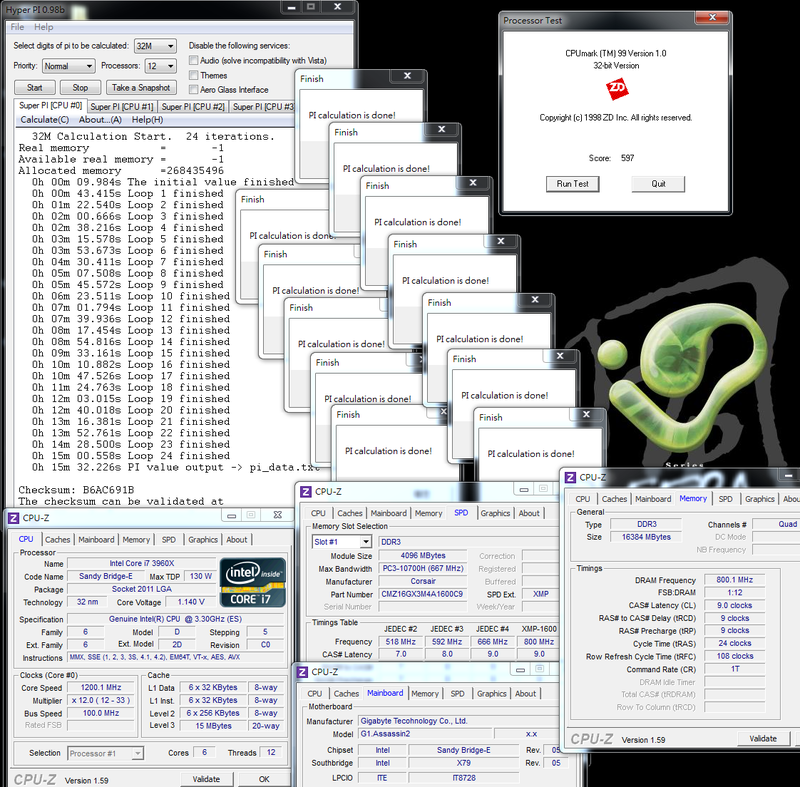 This software need to improve the multi-core support. 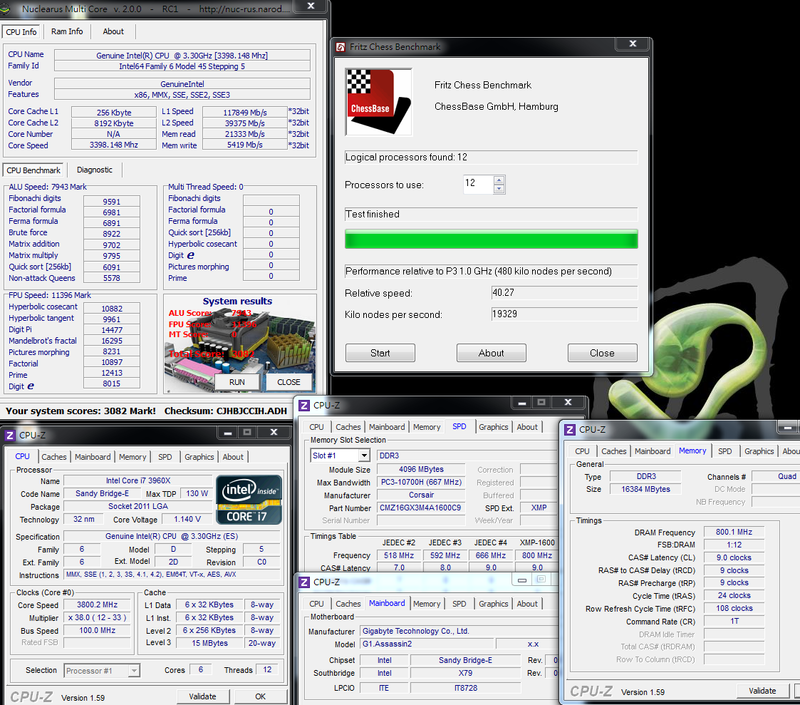 Fritz Chess Benchmark 6C12T performance is higher than 2700K, 4C8T, when it OC to 5GHz. MEM score is almost double LGA 1155. 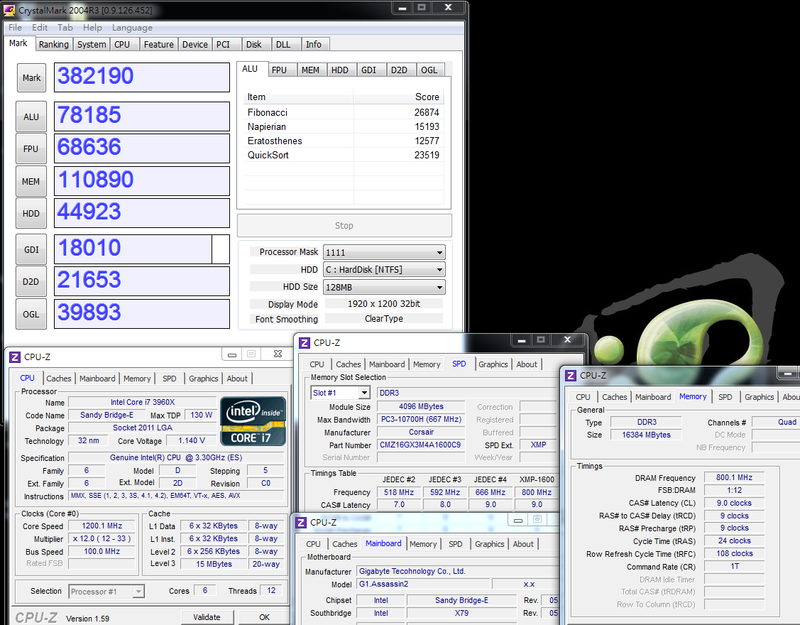 LGA 2011 quad channel bandwidth has really good advantage. Single core performance is similar to 2700K default, but multi-core full speed performance is 18% higher than 2700K running at 5GHz. x264 video spec is getting more and more popular. Many people covert video to h264 or x264 format. 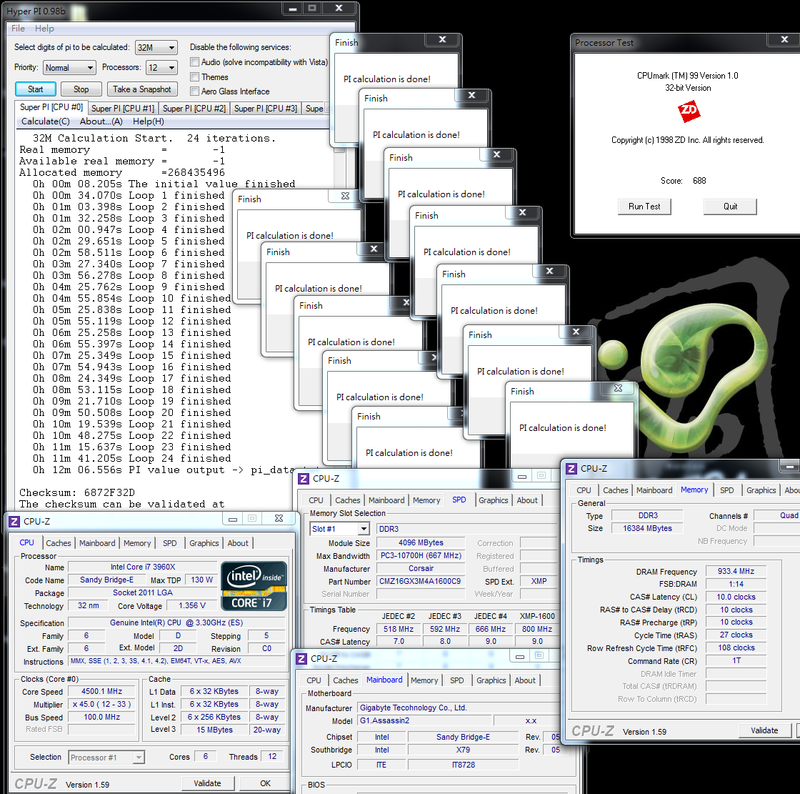 In this condition, CPU multi-tasking performance is very important. You can see 3960X has very good performance. 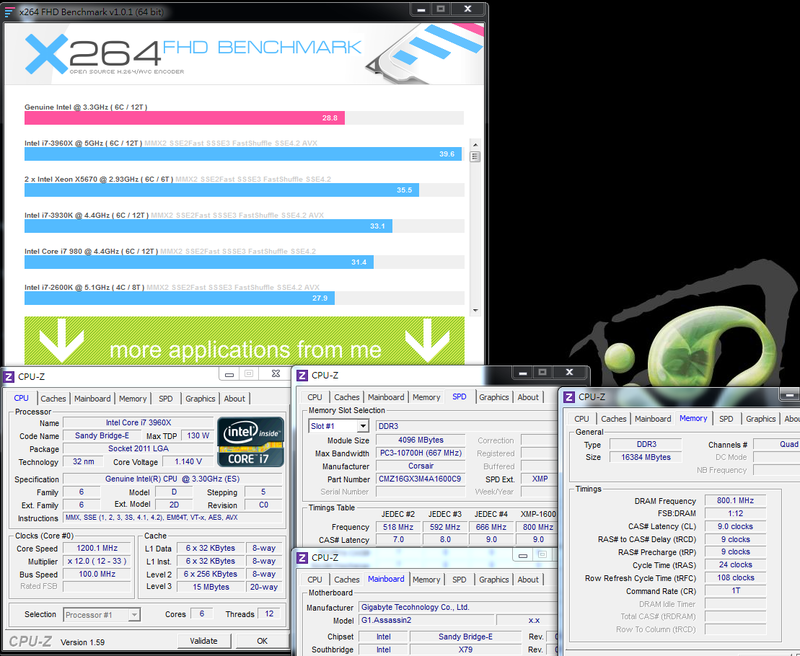 In this benchmark, the score is higher than 2600K OC to 5.1GHz. It?s really saving time. It looks like only SiSoftware Sandra supporting quad channel DDR3 bandwidth. 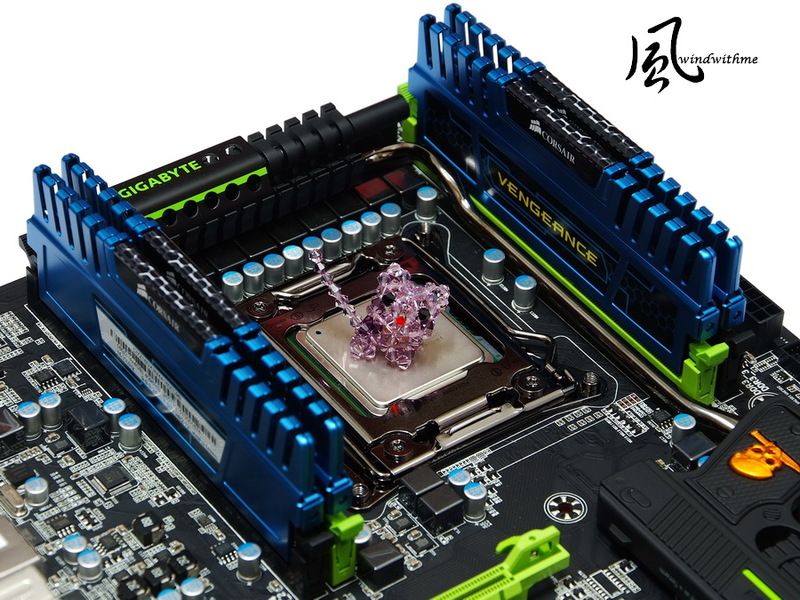 The DDR3 1600 bandwidth is almost double of LGA 1156 platform. ADIA64 and MaXXMEM seems don?t support quad channel yet. I hope the next revision can support it. 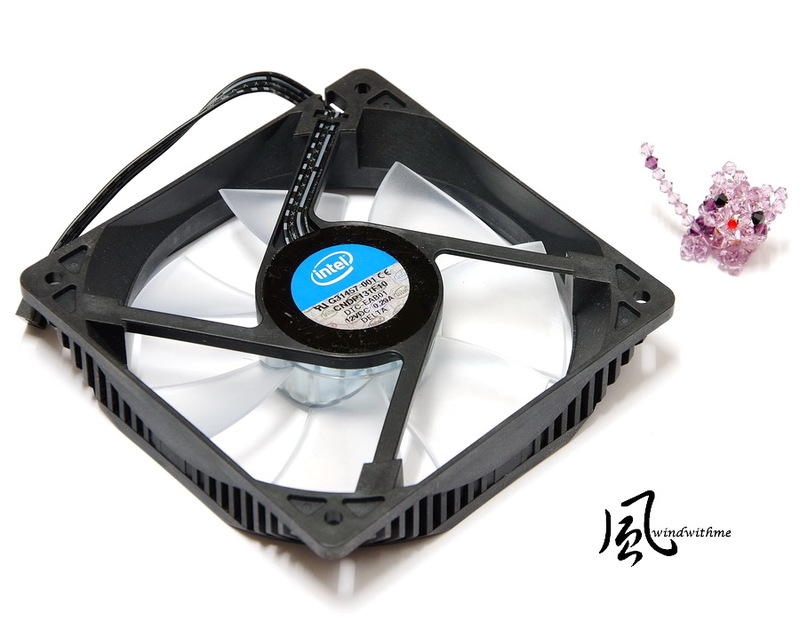 Intel RTS 2011LC water cooler radiator change to two 12cm fan and the heat dispersion is very good. Enter to OS Desktop is around 30 and full speed is below 50. 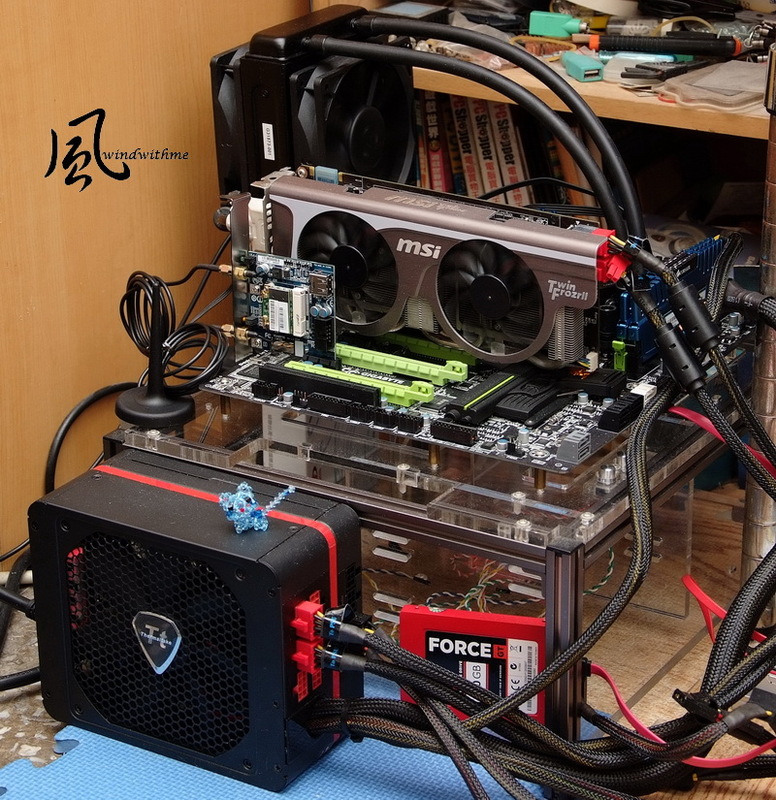 For multi-core and high performance platform, this is very good. After stability test for a while and fixing CPU voltage at 1.135V, C1E mode make CPU voltage vibrate between 0.800 to 1.240V as CPU clock changed. 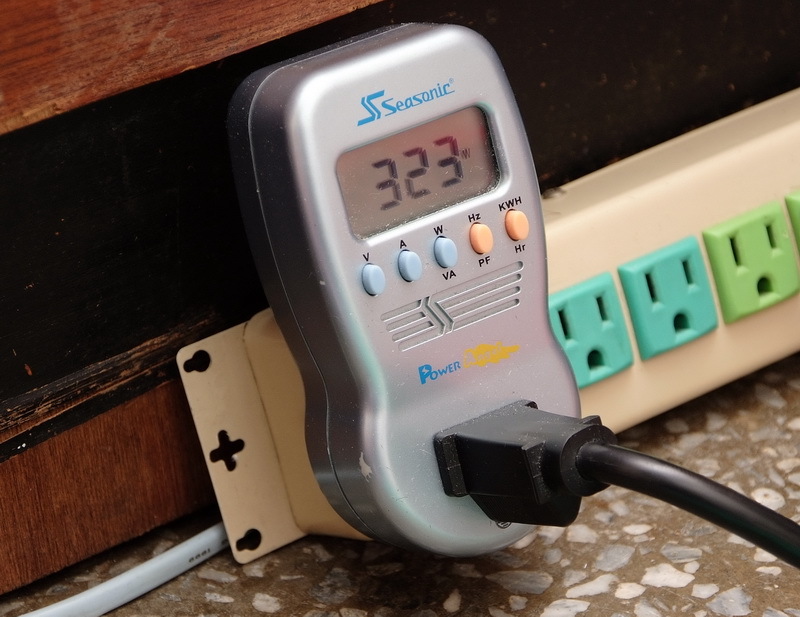 This voltage only increase 3W in OS desktop but lower 30W in full speed which make full speed power usage be more efficient. 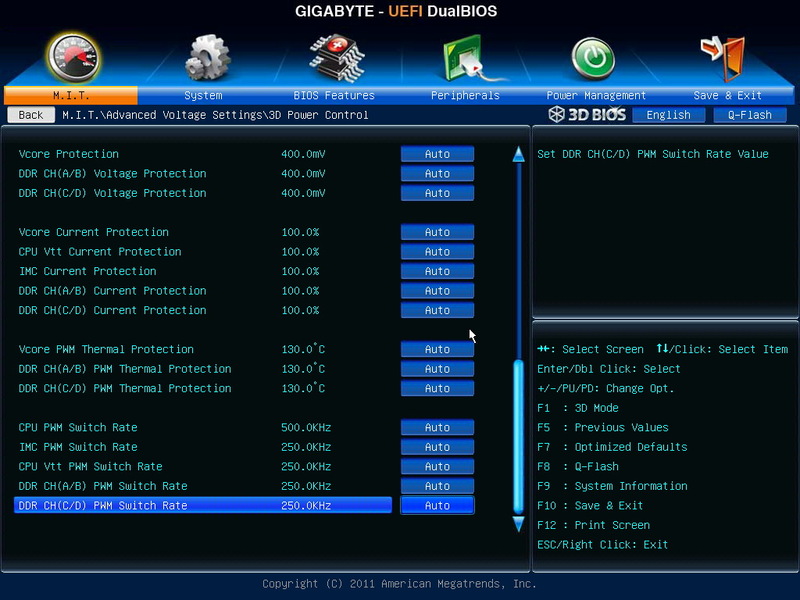 GIGABYTE BIOS spec in UEFI technology in X79 series. The main screen has 2 parts, this is different with other UEFI BIOS. First interface is 3D BIO. The GUI is using product outlook. Users can move mouse cursor to hardware part, and enter to frequency or voltage setup. Click in PCI-E/PCI part screen. Lower-left corner rotation logo can rotate MB angles. 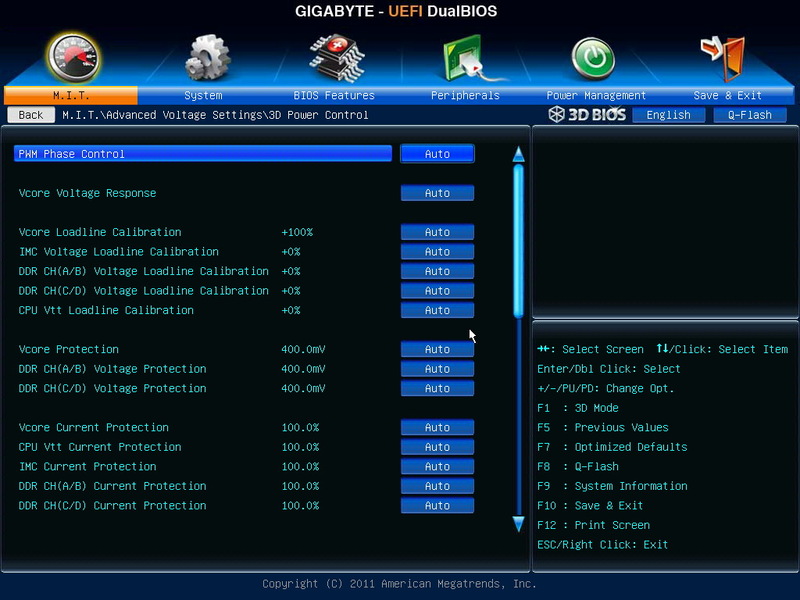 This interface is more fit GUI and user can understand the system status easily. Press ECS to shift to normal UEFI page. 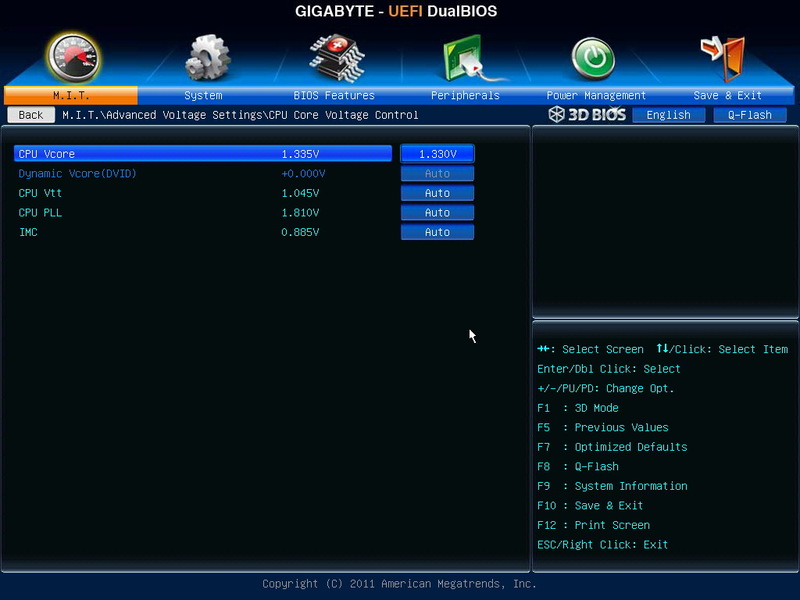 Even though transferring to UEFI, the items are almost same to old BIOS. Users have no adaptation issue. 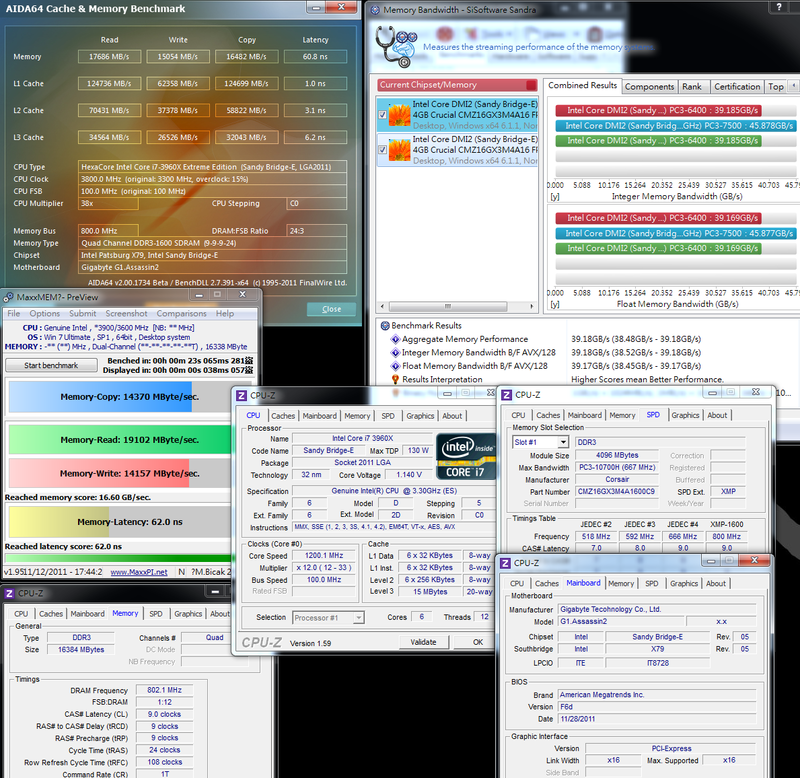 Below is windwithme setup in OC mode. First of all, the CPU ratio adjust to 45. You can adjust individual core ratio and choose how many cores you want. C1E is power saving mode. Intel Turbo Boost is opposite C1E. CPU speed will increase by loading status. Due to it is quad channel, you can set Channel A/B/C/D. I do suggest GIGABYTE can add one more option to setup all channels at once. It will be more convenient. 3D Power Control, I don?t change any items here. Very rich voltage items for enthusiasts to fine tune the system. 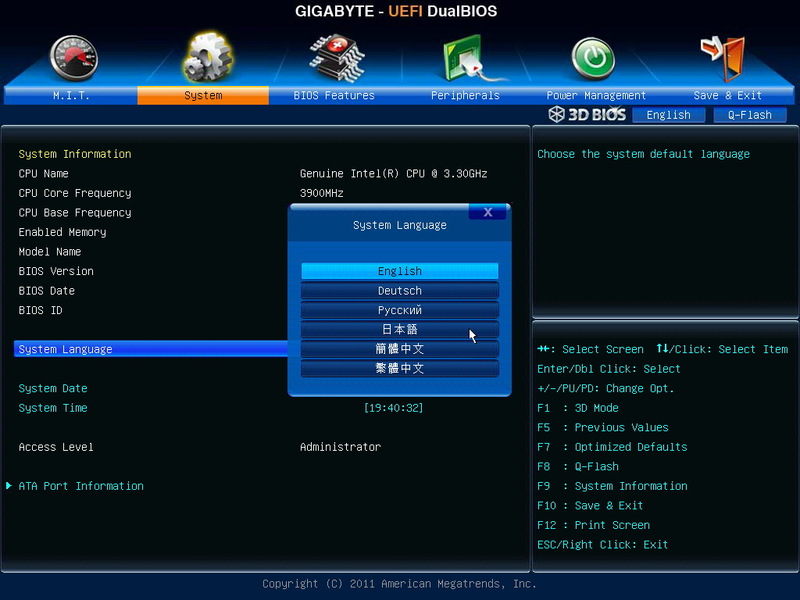 This BIOS provides 6 different languages. 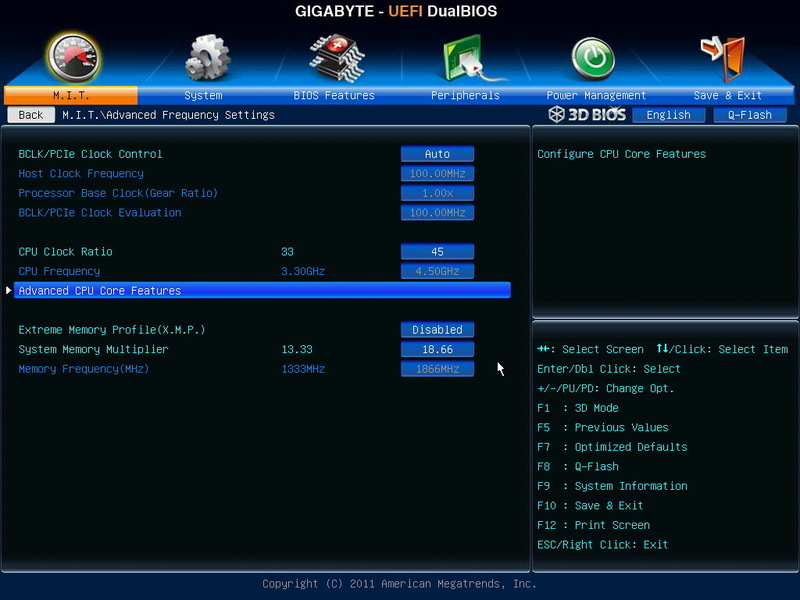 Sandy Bridge-E CPU can OC by 2 ways. First is increasing ratio and the other is pull frequency. Of course, you can adjust simultaneously to get the best performance. If DDR3 set as default, 100MHz, based on quality, the range is around 1600~2400. 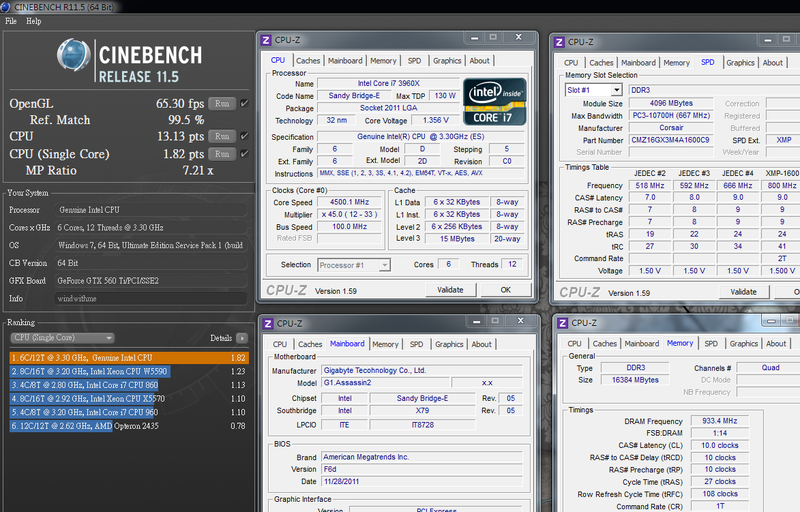 Setting above is my 3960X running at 4.5GHz. Every CPU quality and cooler are may vary. You will need to fine tune some items. 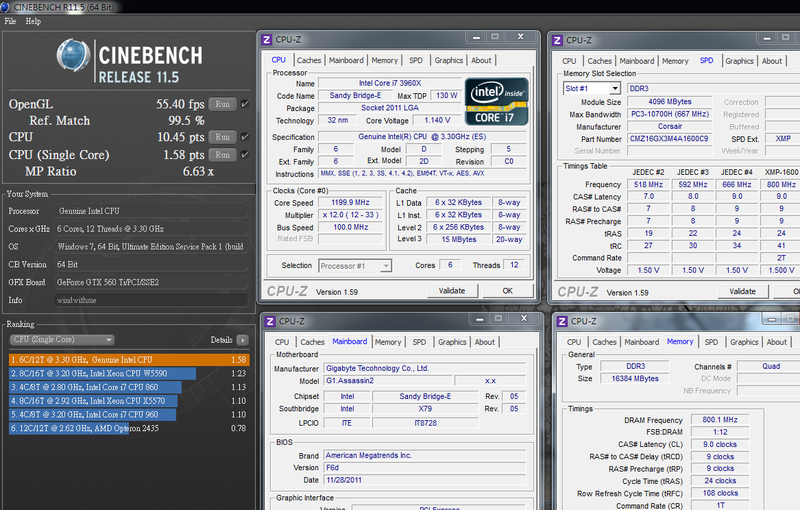 3960X OC to 4.5GHz, the single core performance increase around 20% and multi-core increase 20~30%. You don?t need high voltage for this clock. You can use this setting for long time stably. Both OC and practical usage can run smoothly. 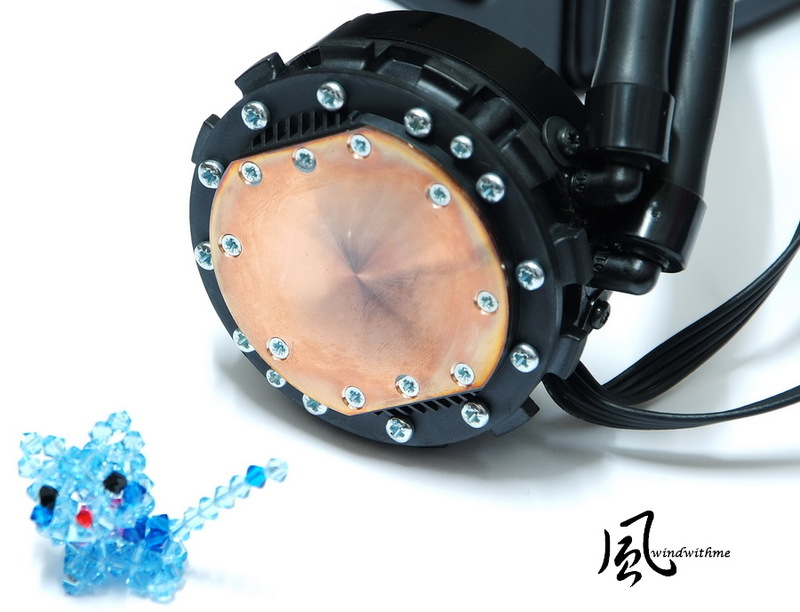 Of course, you can go higher speed, but you need rise the voltage or improve your cooling kit. x264 video converting rate increase from 28.8 to 35.7, about 24% higher. You can save lots of converting time. If you have high demand for this, single thread and multi-core are very important. 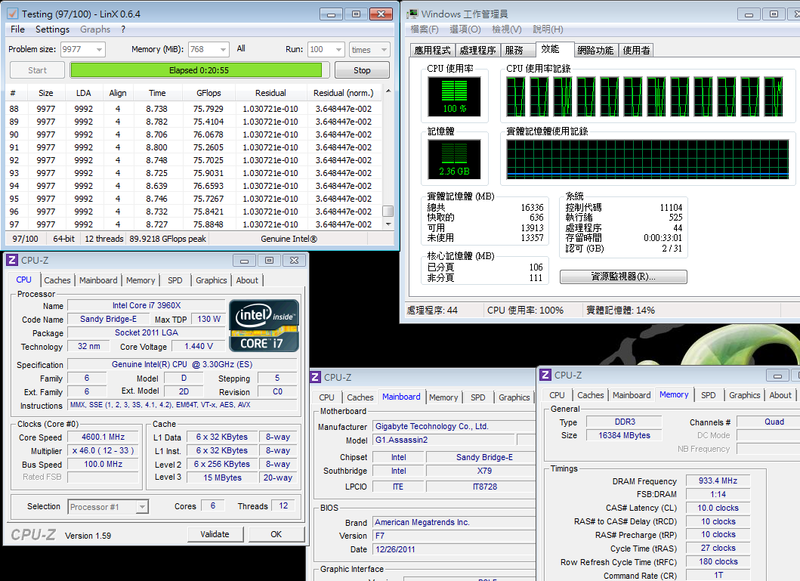 DDR3 performance increase 15~20% as speed OC from DDR3 1600 to DDR3 1866. 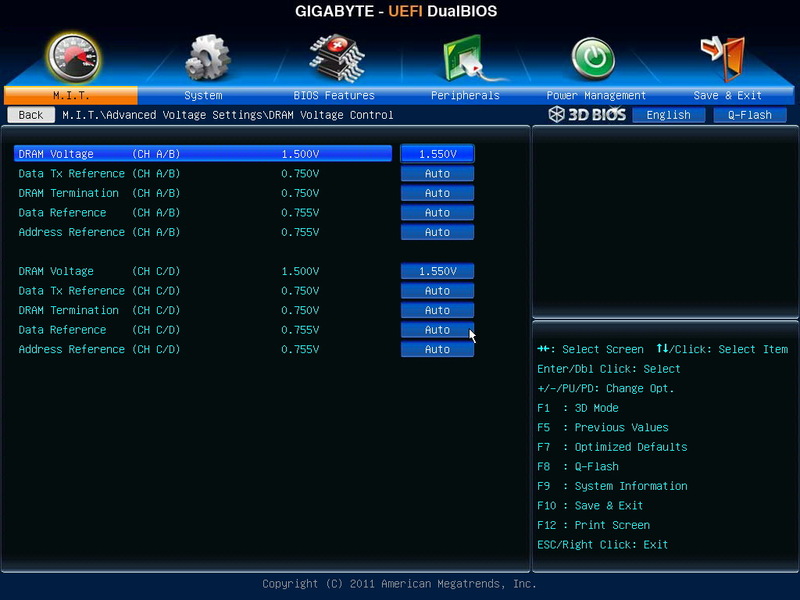 No matter Sandy Bridge or Sandy Bridge-E, DDR3 bandwidth is extremely high. Especially the quad channel strength, the bandwidth is amazing. 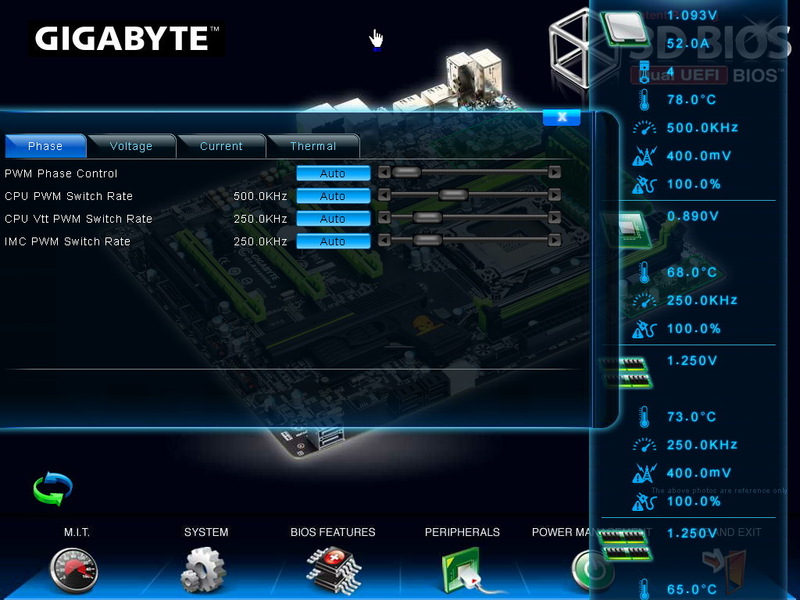 This is the key advantage of LGA 2011. After pulling high clock and voltage, CPU full speed temperature rise obviously. It?s lower 70 in full speed condition. If you install in chassis, it will increase another 3~5. For 6C12T, it?s pretty good. Disable C1E mode, enter to OS desktop consume 151W. If setting CPU as default and disable C1E, it consumes 120W. In OC condition, power consumption increases a lot. It?s 131W more than default mode. However, the performance also enhances 20%. It depends on your idea. If the high performance cost you 323W, will you think it?s acceptable? I think it?s still ok. 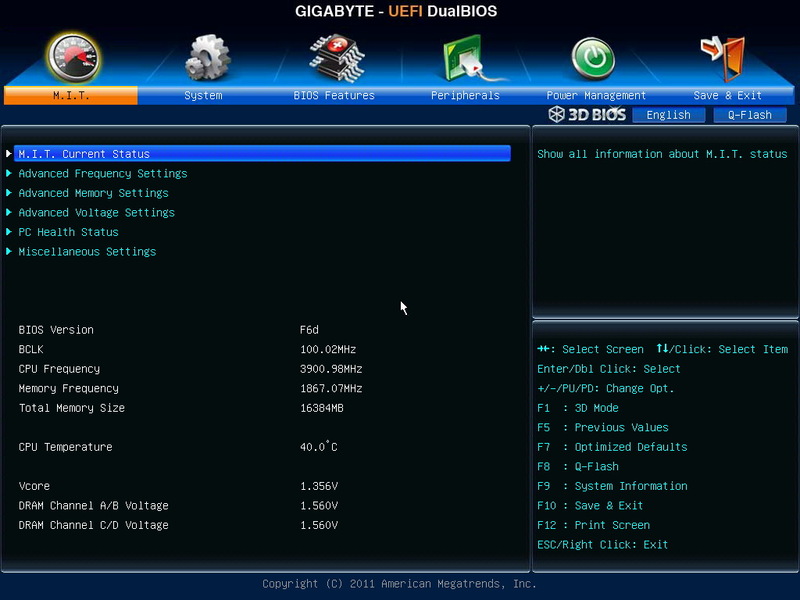 I just flash BIOS to latest F7 and running stability test at 4.6GHz. After burning test and measure the MOSFET highest temperature is 85 degree C.
For next few X79 models review, I will also provide this temperature for reference. CPU voltage fluctuation is bigger than old BIOS. 1. G1-Killer series packing and components are better than own high end product. 3. Built-in Creative CA20K2 audio chip, Japanese high end audio caps and 128MB Memory cache. 4. Killer E2100 Networking NPU with 1GB DDR2 cache for better networking traffic management. 5. 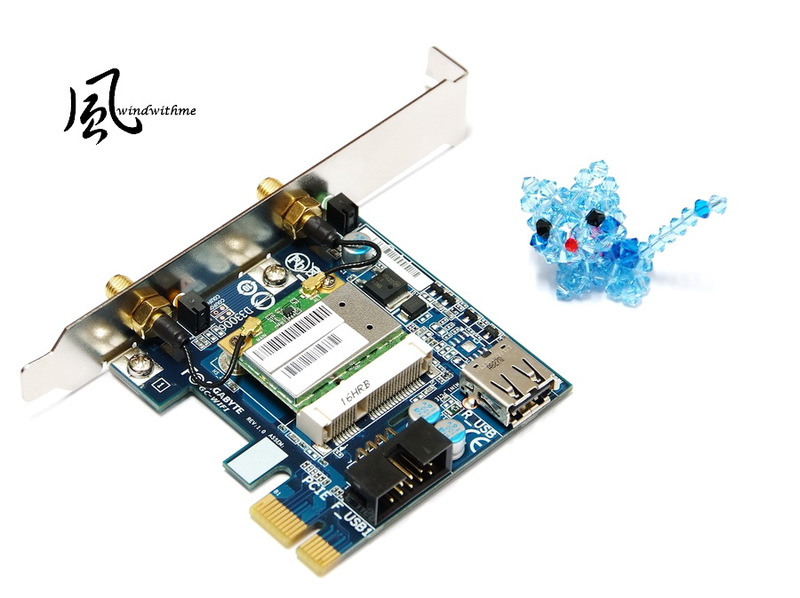 Unique BT4.0 and Wi-Fi PCI-e card. For mobility century, this is really useful features. 6. Front panel has USB 3.0 and quick OC features. It also has audio headset amplifier. 3. Before booting screen, if you click USB KB in advance, it may cause undetectable issue. 4. 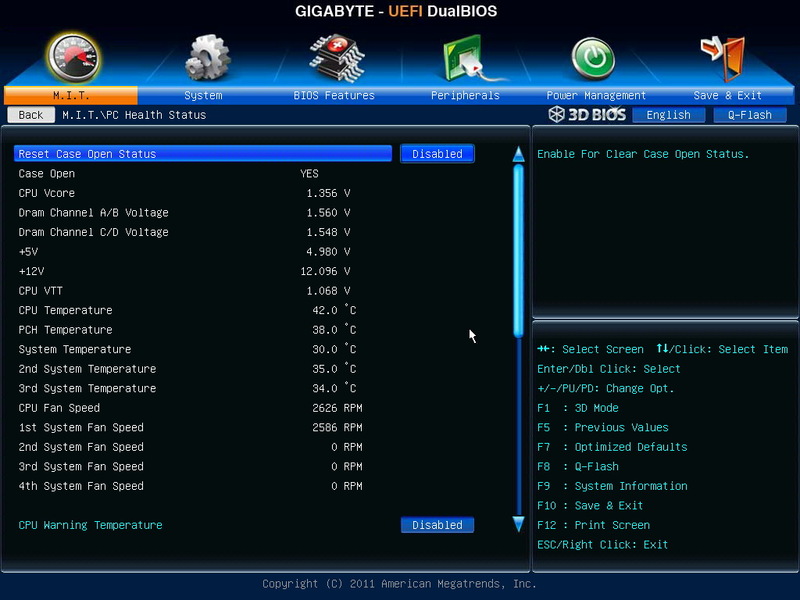 CPU voltage fluctuation is bigger between standby and full speed. All MB makers launch X79 series to replace X58. The price is around 265~430 USD. For users don?t have high end audio or LAN card and you are considering to buy these two high end cards, G1 cost should be similar. 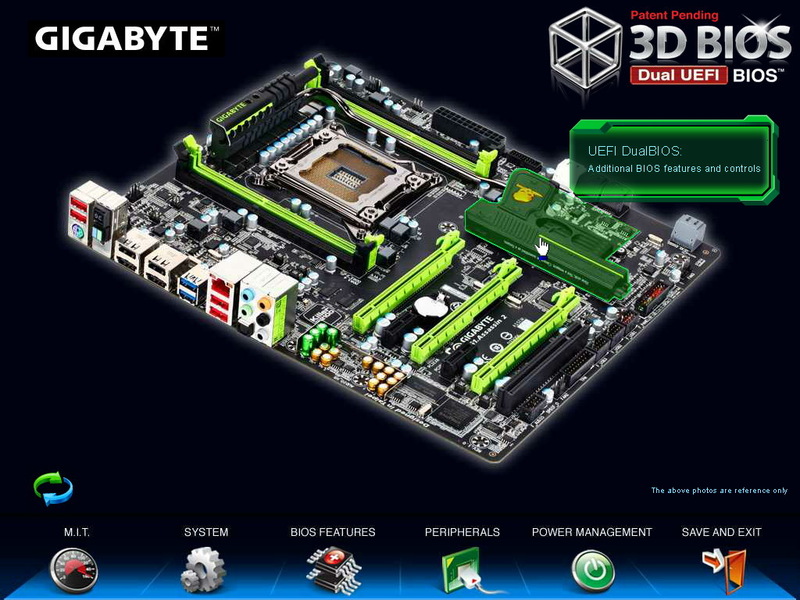 LGA 2011 is Intel most high end product. The price is top of pyramid. You can pick up the platform by budget. Sandy Bridge structure has very wide. Lowest H61 can combine with Celeron G530. Entry OC has Z68 with i5-2500K. Mid-end OC has Z68 with i7-2600K/2700K and future you can have X79 plus i7-3820. 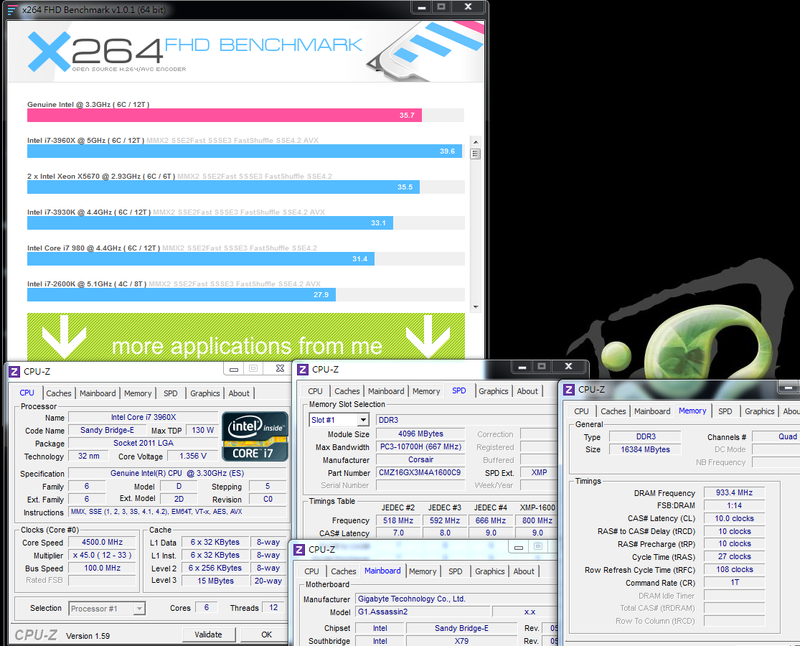 If you need heavy multi-tasking and shorter working time, X79 with i7-3930K/3960X is the best performance combo. The test result above shows Sandy Bridge-E structure is still the king of Desktop performance. 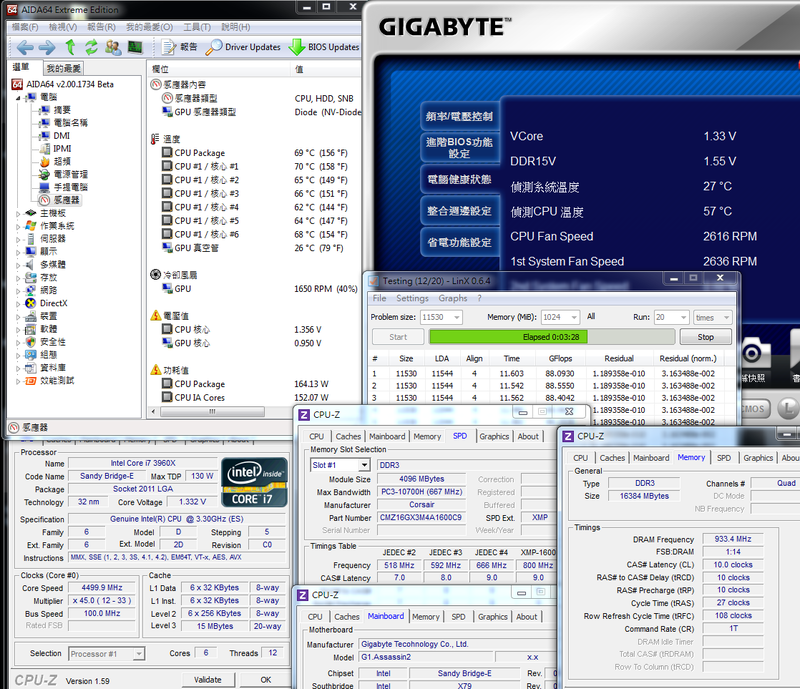 There are i7-3930K and 3960X, 6C12T, CPU support multi-tasking performance. LGA 2011 CPU pricing structure is same as LGA 1366. Till 2012, i7-3820 4C8T launched, the enthusiasts will have one more choice. This year, there is only i7-2600K/2700K with Z68. Soon after, X79 with i7-3820 will become another option. Windwithme will keep sharing more brands X79 performance and OC guide. Wish all Happy New Year 2012 and you can find your best C/P PC combo in 2012.Thanks.